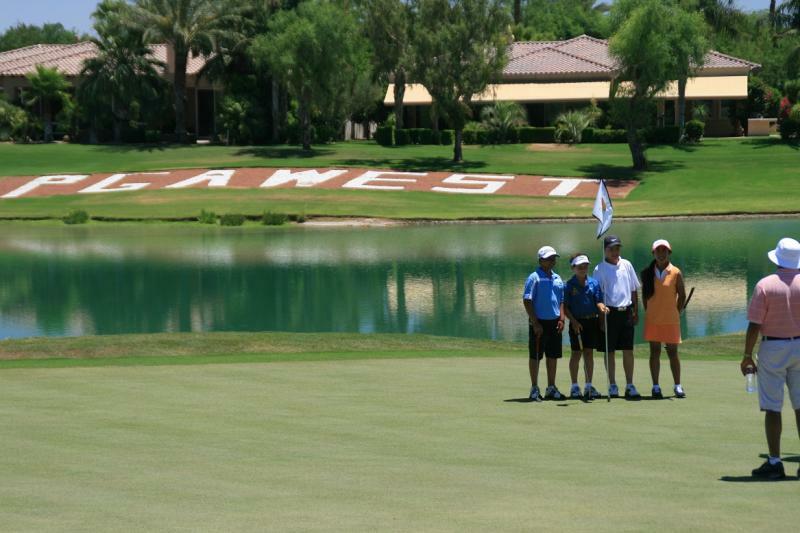 July 12-14: Callaway Junior World Championships. Comments: Played really well considering he'd come out of Australia's Winter and had to "cram" his preparation into the week before the tournament. Giving a year away in age is virtually impossible to recoup in this age group, so his goal was to be the best 9-year-old and let the best 10-year-old's fight out top place. Karl was 5th in the field for Birdies for the tournament, but lack of opportunity to work on his short-game leading up to the tournament cost Karl around 3 shots per round. Next year he'll need to get around that somehow, as his long game was amongst the very best. July 17-19: FCG World Championships. Comments: The best result we could have asked for. Karl's short game returned to it's best and he was competitive with the bigger boys off the Tee as well, giving him an excellent result. The only area of improvement could be his ability to focus for the full round, but in saying that, almost every player had problems with the temperatures reaching 111 degrees in the shade and the players all getting a little hot under the collar. "Karl Vilips of Australia capped off a remarkable comeback to claim the Boys 9 division in exciting fashion on Pinehurst No. 8. Vilips began the day three strokes behind the lead, but did all in his power to come out on top, carding a final-round 5-under-par 67 to come out on top by a single stroke. He recorded a birdie on No. 18 to edge David Hu of Canada by the slimmest of margins. Hu did all he could to catch Vilips, as he birdied Nos. 17 and 18, but still came up one stroke shy at 5-under-par 211." Karl showed phenomenal determination to attempt to overhaul Leaders in consecutive rounds. He opened with a 1-over 73 that left him 2 behind the leaders after the 1st round. The final 2 holes of the 2nd round had to completed at 7am this morning due to thunderstorms that lashed Pinehurst yesterday, seeing Karl shoot a 2-under round. The commencement of the 3rd & final round saw Karl trailing the 2 leaders by 2 & 3 strokes respectively, but still playing in the same pairings as the 2nd round. That left Karl with the challenge of setting the pace one group ahead of the leaders who were immediately behind him. He came out firing on all cylinders and by the turn had chalked up a 3-under front 9 with long driving and scintillating approach shots. The middle part of the back 9 saw the nerves start to kick in,but despite racking up a bogey on 13, he answered back immediately with Birdie on 14, he also added a further Birdie by sinking a 30-foot putt from off the green on the 18th to clinch a 1-shot victory. This is Karl’s 2nd consecutive US Kids World Championships win. It’s by far the best and biggest junior tournament in the world for kids age 6-12 and is played on magnificent courses here at Pinehurst. The same players who compete at the Callaway Junior Worlds in the 12 & Under come here also, but the reason for this tournament’s popularity is that unlike the Callaway's, it has single increment age divisions and is played on vastly superior courses in these age divisions. The scorecard for the tournament is available ﻿here﻿. August 6, Morning: 8am. Karl has now finished putting out on the 16th and played the remaining 2 holes to complete Round 2 ater having resumed play at 7am. He got that tricky putt for Par on the 16th and was putting for Birdie on both the 17th & 18th, but had to settle for Par on each. As it now stands ater 2 rounds, Karl is sitting outright 3rd, 3 shots behind the leader and with 4 shots separating himself and 4th. The winner after the final round (which should hopefully get finished this evening) will most likely come from one of the leading bunch of 3 players, so Karl is in with a real good shot at his 2nd title here. We need today's final round to be completed, otherwise the positions after Round 2 will be final. August 5: Weather saw the 2nd round remain incomplete for the final 5 groups, with Karl sitting at 2-under for the round with a 9' par putt remaining on the 16th Green when the siren sounded to halt play for the final time at 8pm. Karl played pure golf to be 3-under for the first 7 1/2 holes before play was halted due to approaching thunderstorms. It bucketed down for a few hours before play was able to recommence, but it became hard work for the players thereafter. Karl bogeyed the 11th and answered immediately with a tap-in Birdie 3 on the following hole.Failing light and heavy rain set in as Karl putted for Birdie again on the 16th, but with him battling to read the green speed due to the lack of light, he uncharacteristically ran his putt 9' past the hole. The Horn sounded as that Birdie putt left his putter, leaving Karl to (hopefully)make that putt and complete the final 2 holes of his 2nd round at 7am in the morning before returning at 1.10pm for the 3rd & final round. It appears that Karl is 2-shots off the lead and sitting either 2nd or 3rd as it stands right now. August 4: The completion of Round 1 of the US Kids World Championships sees Karl shooting a 1-over par 73 and sitting 2-shots behind the leaders. Karl's round contained a combination of long driving that was complimented by numerous short irons that peppered the flagsitck and netted him 2 Birdies on the front 9 to go to the turn 1-under the card. The 100 degree heat tested the player's concentration including Karl's. The par 5 11th hole saw his round take a hiccup with a triple bogey 8. True to form, Karl came back with 2 further Birdies and a bogey after that to finish what was an otherwise superb display of shot-making and putting. August 2: The US Kids Worlds opening ceremony was held last night in the picturesque Pinehurst village. The village gets right behind this tournament and sees a full-on parade complete with marching bands, team mascots, pagaent Princesses in sports cars and of course, the kids from every country parading behind their respective national flags. Karl's official practice round yesterday saw him playing awesome Tee to Green golf. Of 18 holes, he was putting for Birdie an astonishing 16 times. He was reading his own putts yesterday while I was on the video. His reads were so close to being right, but it's so hard for a 9-year-old to trust that a putt should come in from the high side of the cup, that again, he shaved the cup low-side on almost every putt, managing just the one Birdie. That's good though, as I prefer to see Karl hungry for Birdies come tournament day, and as this tournament allows caddies, we'll team together to start converting more of those Birdie putts. The rest of Karl's game couldn't be better, with him "booming" his drives like a younger Bubba Watson to distances that he's never gotten close to before. Better still, he only missed 2 fairways again. The Pin placements yesterday were bordering on impossible, so while others were regularly 3-putting, the absence of any 3-putts on Karl's card was due entirely to his speed being as good as I've ever seen. Even Par could win this tournament, so Karl's going to give it a genuine nudge. Today is Karl's last practice round, so we'll cart it again today to save him from the record-breaking heatwave that we've been privy to here in the South East corner of the US that sees yet another day over 100 degrees with forecast afternoon thunderstorms. He'll then spend the rest of the day indoors with a mate. August 1st: With Pinehurst # 8 unavailable for play today, Karl played the host course for the his age divison for next year, the Little River Golf Club. The yardage was 400 yards longer than what he'll play at Pinehurst #8, yet he still managed a 1-under round of 71 that saw him reach almost every green in regulation. His new Driver is pummeling the ball longer than he's ever hit, resulting in less club coming into the green. He had 4 Birdies today and left so many tantalisingly close that shaved the cup, so hopefully those Birdie putts are saving themselves for the Worlds starting this Thursday. It's hot & humid here, so rather than fatiguing Karl by having him hitting on the range excessively under a blazing sun, Karl has practised for around an hour early each day and focused on playing practise rounds so as to get to know the couse better, then spent the afternoon hanging indoors with friends. This strategy of striving to keep Karl "fresh" may or may not pay off, but it's what we employed in California last month and seemed to work there. July 29th: Easy day today for Karl. We'll spend an hour down at the range and chipping green, then he'll spend the rest of the day somewhere between the swimming pool and the cartoon channel with his friends Colin and Symon. July 22nd: We're in Pinehurst now after having flown to Orlando , Florida and then driving the 9-hours up to Pinehurst, North Carolina. Unfortunately our travel agent was too busy to even look at changing our flights to a closer city, hence the long drive. Karl's now had his first hit at Pinehurst #8 and has taken an immediate liking to the longer nature of the course, having a 1-over in his first practice round which showed how penal the rough and the fairway bunker placements can be here on this magnificent Tom Fazio layout. We expected he needed more carry on his drives for this course, so had gone down to Bob at Roberts Golf who custom fitted Karl into a 12-degree lofted Driver which immediately gave Karl an extra 20 yards of carry. It may not sound like much, but it'll give Karl more chance of getting closer to front Pin positions by using a higher lofted club coming in. July 19th: The FCG World Championships come to a conclusion with the course being faultless and the organization first-class. It was another successful tournament for Karl, seeing him achieve both his goals of finishing Top 5 and winning the Underclassmen Award for the 9-10-years Boys after having lost in a Playoff for 1st in last year's 7-8 Years Boys. In what can only be described as debilitating 110 degree desert heat, many of the players battled to generate the energy they needed to reach their normal yardages, with many balls falling short of greens and into many of the lakes which Jack Nicklaus had cunningly placed in front of many greens. Karl dropped 1 ball painfully short and and saw another run over the back of a green and into water to rack-up a 6-over 78, yet still managed to hang onto his overnight position. 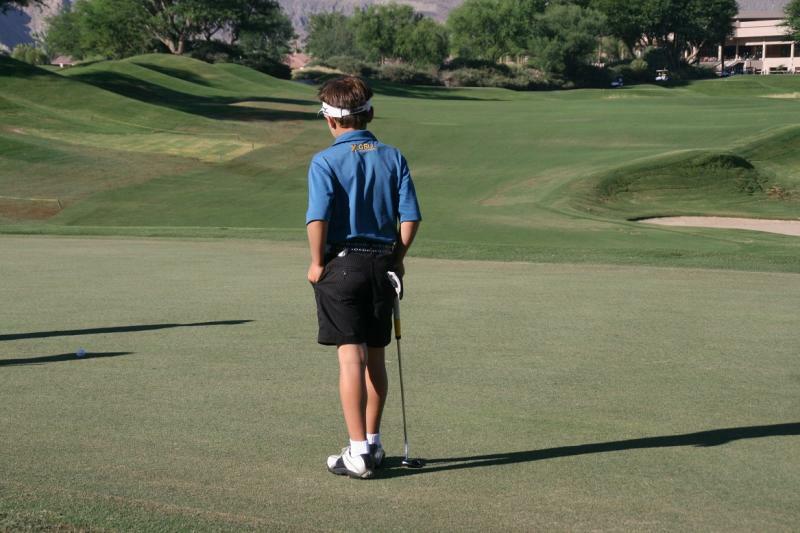 The heat wasn't the only thing going into meltdown here at PGA West as Karl's frustrations boiled over for a few holes. Once he can conquer that demon he'll be unbeatable, but that's going need to a lot of work. His short-game has been the highlight of this tournament with his up & down percentage being the highest I've seen, so once he and the other longest hitting 9 & 10-year-old players can find the extra 50 yards they need to match the winner off the Tee, they'll be in business. The Leaderboard can be found here. July 18th: Karl's frustration at seeing so many putts burn the hole without going in takes it's toll and he loses his cool in the 110 degree heat. Karl seemed fatigued in the searing desert heat and wasn't getting good swings on his strokes at the start of the round, seeing him incur bogey, double bogey and bogey early on after starting on hole #9. After asking him whether he'd prefer to withdraw, he shook back into action and parred the last 9 holes whilst still seeing numerous Birdie putts continue to shave the hole. The greens are in perfect condition, so he couldn't ask for better greens. Full credit for Karl for trying to read PGA quality greens solely by himself, but at a world championships which allows caddies, there comes a time when he needs to use all the input he can get, as he was the only player in the lead group who refused to ask for help with reading the greens. His short game was deadly again today though, getting up & down from every corner of the course to save par whenever his tired swing let him down. However, Karl's stubbornness and temper continue to be his sole problem. Bring on Bob Rotella! We've found a Driving Range now that's open in the relative cool of the evening, so we'll be heading down there this evening after Karl gets back from watching a movie with his mates. That should iron out any wrinkles that have appeared in his swing these past 4 days where he's not been down to a range and see him shoot lower tomorrow. Karl's still on target to win the Underclassmen Medal for his 9-10's age bracket. To view Karl's scorecard, click here. July 17th: The 1st Round of the FCG World Championships is done. A shot-gun start at 7.30 saw only the back half of the round effected by the 110 degree temperatures. Age groups up to 12 years are permitted to use carts and caddies, without which it would have been hazardous for the young players. Karl played without a caddy as his Dad stayed out of the sun after being affected by Heat-stroke yesterday, so his 1-over round sees him sharing 3rd in the 9-10's and the outright 9-year-old leader. Check out his scorecard at here. Karl hasn't had any range work since we arrived due to most of the Driving Ranges here (oddly) closing at 5PM. It defies logic, as the players would otherwise be able to practice in the shade of the mountains here from 6-8.30pm. As such, Karl was restricted only to some short-game work in the shadow of the mountains yesterday evening. I think that the decision to rest Karl completely was a good one, as some player's who's Dad's had them practicing in the baking afternoon sun yesterday appeared adversely affected and submitted poor scores. As I write this Diary entry, Karl is having a pizza night with other players. July 15th: Karl completes his FCG World Championships practice round. Karl's arrived into Palm Springs and has had the first of two practice rounds. It's desert heat out here and was simply too hot to hit the driving range, but nevertheless, Karl played 18 holes with 2 of his fellow competitors and took an immediate liking to the Jack Nicklaus Tournament course at PGA West here at Palm Springs, California. The greens run true on this course, so his Putts went as expected and he finished his round with 3 Birdies. This Par 72 course will suit Karl's long Driving, so although he's playing against most of the same players from the Callaway Junior Worlds, that was played on a much shorter course which came down to a short game competition, whereas this course will reward stroke play both off the Tee and from the Fairway. July 14th- 3rd & Final Round, Callaway Junior World's: Karl came agonizingly close to achieving this year's target of a top-10 finish in the 9-10 years Boys, finishing 13th at this year's championships and the 3rd placed 9-year-old. Karl's lifted his ball-striking to a new level in the short time he's had to get ready, with his driving accuracy and length undoubtedly his biggest weapon. He continued to give himself countless Birdie opportunities which saw most putts either shave the cup or drop in and was ranked 5th in Birdies for the entire field over the 3 days of the tournament. Without doubt, Karl's Achilles heal was his chipping, costing him at least 3 shots per round. Irrespective, after having had such a disrupted and turbulent 12-months, Karl did himself and Australia proud with his efforts here. 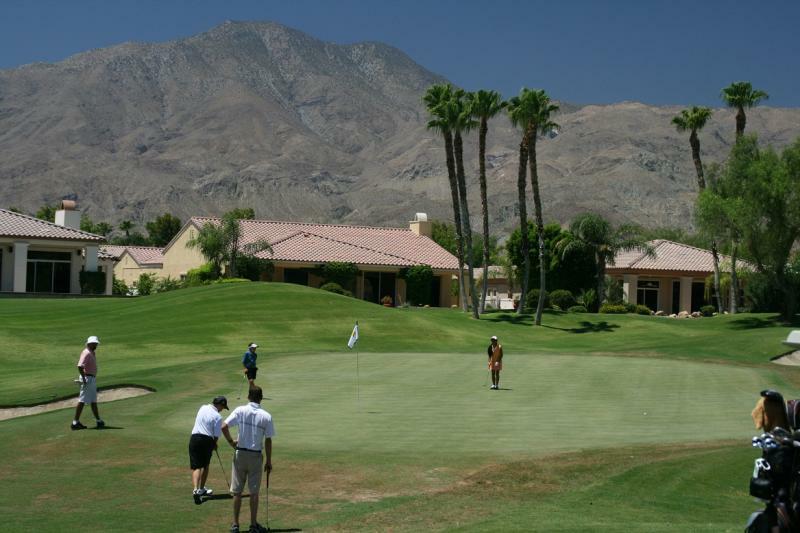 The FCG World Championships start in 3 day's time here in Palm Springs, California. The Jack Nicklaus design demands accuracy off the Tee which will suit Karl. For the record, Karl got into a play-off for this title last year which lasted 7-holes before California's Alex Park eventually sunk a Birdie putt to take the title. However, both boys have got some stiff competition from the Chinese and Japanese players who have their coaches traveling with them, as well as California's own champions who have dominated the various world championships since the days of a young Tiger Woods. We drove the 2-hours from San Diego to Palm Springs immediately following the final round of the Callaway's and Karl was a keen to get to the chipping green. However, he needs the rest so he'll get down to that in the morning instead of this afternoon. 13th July- 2nd Round, Callaway Junior Worlds﻿: Moving Day at the Callaway Junior World's sees Karl shoot up the Leaderboard with a 1-over par round in the 9-10 year boys. Being Tied for 13th, Karl is the 3rd lowest 9-year-old in the field and just a shot away from achieving this year's goal of grabbing a top-10 finish overall. After reeling off 10-straight Pars, Karl Birdied the 12th Hole and looked to have broken free of his shackles before unexpectedly taking Bogey with sloppy short-game on each of the next 3 holes. As though riding a roller-coaster, he then hit his approach shot to the Par-4 16th to within a few inches to secure Birdie, only to see him take yet another Bogey on the next hole. As if playing to a script, Karl hit his longest Drive of the tournament to leave himself with just a 50-degree wedge to the green which he played to within a few yards of the pin for another Birdie. With an 11am Tee Time for the Final round, Karl will focus on his short game before play tomorrow so as to be able to take advantage of his pure ball striking which has been betrayed by his inconsistency around the green.Karl's ball striking has many people commenting that he has the best swing out there. Many of the the leading boys here have their coaches traveling with them and spend many hours per day on their short game. Karl's lack of short-game work these past months has shown up in glaring fashion, so it's the key component of his game which he'll be working on between now and his primary focus of this trip, the US Kids World Championships at Pinehurst in 3 weeks time. ﻿12th July- 1st Round, Callaway Junior World's: The 1st Round of the 2011 Callaway Junior World's is in the bag. Karl had a very good round that contained 3 Birdies. It was good to see Karl stick to his guns after a disastrous double-bogey opening hole (which is actually the 2nd hole on Karl's scorecard) where he used a club too much straight over the flag and "air-mailed" the green. To his credit he bounced straight back in typical Karl fashion with a Birdie on the following hole to get his round back in shape. a couple of holes which he has had difficulty with in practice rounds again bit him, but he had consecutive Birdies on holes 16 & 17 to negate the damage. Tomorrow's round is full of promise if he can avoid getting off to the costly bad start that he had today. The full Leaderboard is available here. 11th July: Today was the last day of preparation before the 3 days of the 2011 Callaway Junior Worlds. Karl spent 30-minutes at the range before playing his official practice round with players from the US and Singapore and shot a 4-over round, including lipping out for an Eagle from 135 yards on the 18th. Karl's lack of preparation resulting from coming from our short winter days leading up to this year's championships has shown itself every now & then, but he's improved with every round he's played. His goal of finishing inside the Top 10 for this year is still achievable, moreso due to his ability to play without a Caddie and choose his clubs relatively well for a 9-year-old. This age division is Caddie-Free, and that will see many players who are normally guided through every shot by their caddy tend to struggle with club selection and strategy. Karl's length off the Tee helps him as well, as he can just reach the longest Par-3's that measure up to 199 yards uphill. 8th July- Day 2 of the San Diego Junior Masters: A second consecutive round of 78 sees Karl finish 15th at the San Diego Junior Masters. He found the bunkers 4 times today, but pulled off a 100% Sand Save record. Karl's Sand Saves have become a feature of his game. His ball striking was magnificent all day and his length off the Tee was rarely beaten, but he still struggled with course management and his temperament, as well as tentative putting at times which cost him dearly. His plan next week is to get his Birdie putts up to the hole, as although his putting from inside 6 feet was flawless, he saw Birdie chances from 20 feet fall just short every time again. He'll be spending as much time as possible these next 3 days to try to get a better feel of the speed of the greens at the Welk Resort course, home of the 9-10 Years Boys division of the Callaway Junior Worlds, as they are considerably slower than what he's accustomed to. 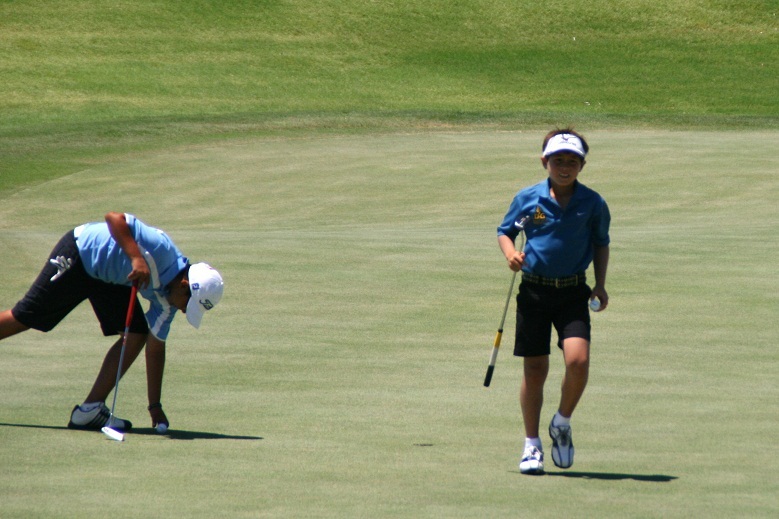 7th July- Day 2 of the San Diego Junior Masters: : The 1st Round of the San Diego Junior Masters 9-10 Years Division is over & done for Karl, seeing him sitting Tied for 8th in an international field of 47 (mostly) 10-year-old boys playing from the Red (Ladies) Tees. At 9-years-of age, Karl still has next year in this same age division, so can be satisfied with being the low 9-year-old in the field. Having found the water twice, the hazard once and leaving quite a few Birdie putts short, Karl played an otherwise fantastic round of golf but knows he has room for improvement. Everyone gets their ball wet every now & then, so Karl will be working tomorrow on taking more advantage of Birdie opportunities when they come to compensate for the occasional dropped shot. Karl played this same event 2-years ago as a 7-year-old in the 7-8 Years Boys and finished 10th before coming 4th the following week in the Callaway Junior Worlds, so he appears to be on target to peak for next week's Callaway Junior Worlds. 4th July: Independence Day here in the US. We found the Welk Resort course (the course for the Callaway Junior Worlds) virtually deserted while most people focused on celebrating with their family and friends over a BBQ. Karl played this practice round well except for finding the water once, finishing with a 2-over round. As Karl is adjusting to the greens, he is finding Birdies coming more often, racking up 4 of them today. Karl's playing pretty well and is gaining form with every practice day. He's spending an hour at the range and playing a practice round in a cart each day at the moment to get used to the courses he'll be playing in the following 2 weeks. Needs to spend some more time on his chipping in the next few days though. Catch you all tomorrow. 2nd July: Played the back nine at Carlton Oaks with a Japanese player he's met previously. Had some adjustments done to his Hybrids by the guys at the Pro Shop here. Quick turn-around time and great price. Also had some fine tuning of a few clubs done by Joel down at Golf Galaxy in San Diego. Joel's done Karl's clubs on previous visits and you'd be hard pressed to find a better clubmaker. 1st July: We arrive in LAX from Melbourne after the 14-hour flight. Karl watched every kids show on Qantas' inflight entertainment. After the 2-hour drive to San Diego, Karl then played the front nine at Carlton Oaks, home of the San Diego Junior Masters. Tee to green was good, but had problems on the greens which aren't anywhere near tournament standard. Still, it'll be the same for every player, so Karl will need to do as best he can next week.